The IEEE 802.11 task group and work spearheaded by the Internet Engineering Task Force has extended the ability to operate time sensitive systems over standard Ethernet networks. Technical work continues that will allow convergence of low latency control traffic and standard Ethernet traffic on the same network. THE INDUSTRIAL INTERNET OF THINGS (IIoT) is growing at an exponential rate, with more manufacturing and automation companies moving to network-based operations and adding new devices to the network. 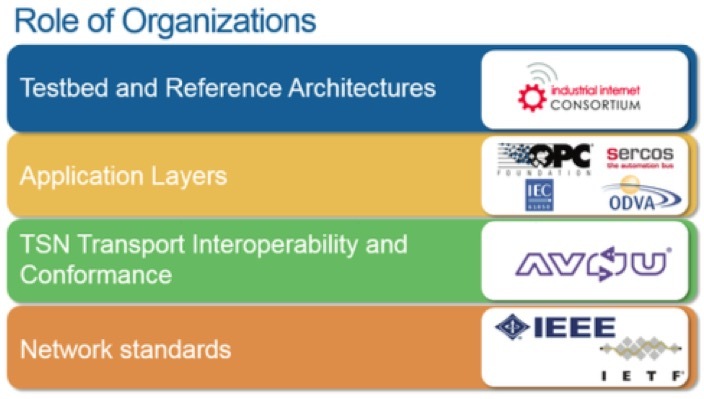 The successful implementation of these connected automation and control networks require a solution that ensures complete interoperability. Standard Ethernet has evolved to enable next generation control systems. With this, recent work by IEEE 802, the Internet Engineering Task Force (IETF), and other standards groups has extended the ability to operate time-sensitive systems over standard Ethernet networks, supporting diverse applications and markets including professional audio/video, automotive, and industrial. These standards, driven primarily by the IEEE 802.1 Time-Sensitive Networking (TSN) task group, define new mechanisms for creating distributed, synchronized, real-time systems using standard Ethernet technologies that will allow convergence of low latency control traffic and standard Ethernet traffic on the same network. TSN supports real-time control and synchronization, for example, between motion applications and robots over a single Ethernet network. TSN can also support other common traffic found in manufacturing applications at the same time as the control, driving convergence between IT and operational technologies. As the Avnu Alliance (avnu.org) has shown success in audio/video applications, it is helpful to be able to reuse this technology in modern machines using video cameras in control loops. As TSN-based network infrastructure become more prevalent, many of today′s modified Ethernet networks can move to TSN-based networks, using their OT-based application layers on standard 802.1 Ethernet. In January 2017, National Instruments announced the opening of the NI Industrial Internet of Things (IIoT) Lab, sponsored by Avnu Alliance and others at the Austin, TX headquarters. The NI IIoT Lab′s goals are to foster collaboration between various vendors to prove out interoperability. In this space, communication protocols, controller hardware, I/O components, processing elements, and software platforms are combined to validate end-to-end solutions that will dramatically change the way businesses operate. A working showcase for IIoT technologies, solutions and systems architectures, the NI IIoT lab features demonstrations of real-world industrial industry challenges and how they can be remedied. The on-site Industrial Internet Consortium′s IIC Time Sensitive Networking or Flexible Manufacturing Testbed, known as the TSN testbed, is one such example. The testbed has also been traveling to various industry events across the world. The testbed is a showcase of how TSN standards can work within the manufacturing ecosystem, including high-performance and latency-sensitive applications. The world′s first testbed for TSN was developed with two major goals: to show TSN′s readiness to accelerate the marketplace; and to show the business value of accelerating the adoption of time sensitive networking technology. It stands as a showcase of the value that TSN standards within the ecosystem of manufacturing applications can bring to the market, including the ability for the IIoT to incorporate high-performance and latency- sensitive applications. IIC member participants include key industry leaders like: Analog Devices, Belden/Hirschmann, Bosch Rexroth, B&R, Cisco, Hilscher, Intel, KUKA, National Instruments, OPC Foundation, Renesas Electronics, Schneider Electric, SICK, TTTech and Xilinx - many of which are also Avnu Alliance members. The work coming out of the TSN testbed is already having a direct impact on suppliers and manufacturers who see the technology as a value add for their system structure. The benefit of the testbed is that it demonstrates real-world solutions. One such use case currently being conducted is a setup of two separate large scale robot and automation control suppliers who are seeking to implement TSN technology to increase interoperable communication between their devices and systems. They will coordinate and control PLCs and the monitoring of the sensor data between robots and PLCs. This coordination requires a combination of receiving highly time-sensitive, synchronized information from sensors and then passing control commands back into the environment to other types of devices on the network. Without TSN, these companies would have to perform this communication with separate proprietary, non-standardized networking technologies that may not talk to each other on an IoT network. Now in Q3 2017, Avnu Alliance members and testbed participants are working on new activities and developments, with the expectation that the testbed will continue to grow and expand upon its current capabilities and offerings. According to Dr. Richard Soley, Executive Director of the Industrial Internet Consortium, "Our testbed program is where the innovation and opportunities of the Industrial Internet - new technologies, new applications, new products, new services, new processes - can be initiated, thought through, and rigorously tested to ascertain their usefulness and viability before coming to market." Soley said that the Time Sensitive Networking Testbed, which is housed in Germany and in North America, is used for plug-fest activities where member companies collaborate to test implementations and interoperability. "TSN is important to the success and adoption of the IIoT given its ability to support real-time control and synchronization, for example between motion applications and robots, over a single Ethernet network. TSN drives convergence and increased connectivity, unlocking the critical data needed to achieve the promise of IIoT," Soley added. Tom Weingartner, Marketing Director, Deterministic Ethernet and IIoT Communication Technology at Analog Devices said that "ADI has been involved with the IIC TSN Testbed from its inception. It has always been successful as a tool to test interoperability among industry vendors′ equipment, but ADI finds real value in the continuing evolution of the TSN standards being tested and the growing number of participants involved bringing a diverse set of applications. For any company getting involved with TSN, the IIC TSN Testbed should not only be part of their verification and validation plans, but also part of their up-front development efforts." Axel Schneider, Director R&D at Hirschmann Automation and Control GmbH, added: "To test the interoperability of TSN in multi-vendor scenarios starting right from the beginning of this next evolutionary step of standard Ethernet, pre-competitive joint efforts by the involved innovating companies are needed to ensure the market success of this new technology. Testbeds such as the IIC TSN Testbed, which Hirschmann joined in October 2016, provide the necessary framework for these activities. Moreover, they offer an excellent technical framework for pre-competitive proof of interoperability for key TSN mechanisms including time synchronization, traffic scheduling and configuration in a multi-vendor infrastructure. Thus, testbeds are essential for the testing of TSN as well as the integration of OPC UA with TSN. In addition, testbeds not only offer the possibility to test the interoperability of pre-production products, but also enable early feedback to standardization bodies such as the IEEE and certification organizations like the Avnu Alliance." Technical report by Avnu Alliance.